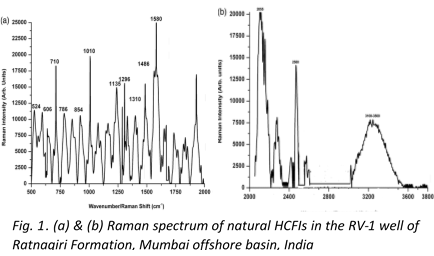 The challenge with Raman spectral studies on natural hydrocarbon-bearing fluid inclusions (HCFIs) is the common presence of fluorescence emission from minerals and aromatic compounds in HCFIs leading to the masking of Raman signals. Selection of optimum excitation wavelength is another challenge. To overcome these hurdles, special wafer preparation techniques, along with the use of fluorescence quenchers, were employed in our study to obtain Raman signals from natural HCFIs. The present study is a demonstration of how best the Raman signals from natural hydrocarbon-bearing fluid inclusions could be detected using an excitation wavelength of 785 nm with suitable optical parameters and with special wafer preparation techniques to negate the background fluorescence. Using the laser Raman technique we were able to detect peaks corresponding to cyclohexane, benzene and bromobenzene, carbon monoxide, nitrogen, ethylene, sulphur oxide, carbonyl sulphide, hydrogen sulphide in liquid form along with the presence of a broad peak of liquid water, peaks of calcium carbonate and calcium sulphate. 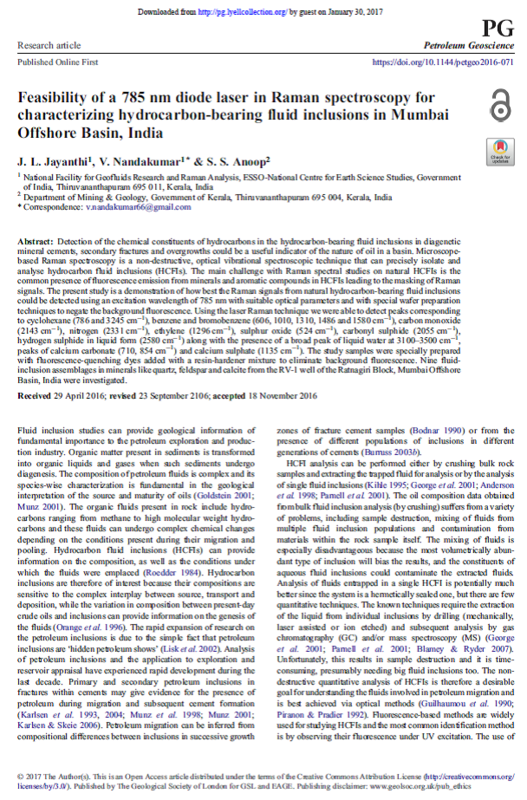 The chemical constituents in natural HCFIs from the same basin identified using laser Raman spectrometric methods with a 785 nm laser excitation agrees well with the GC-MS results of oil in the same basin, which again supports the utility of the laser Raman technique with 785 nm laser for the chemical constituents identification in natural HCFIs. The present study elucidates the potential of Raman spectroscopic methods using a 785 nm laser excitation for detecting the chemical constituents of HCFIs..